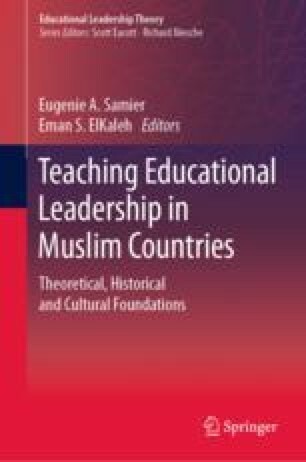 This chapter examines the Islamic humanist tradition as it relates to the teaching of educational administration and leadership in a Muslim context, with implications for intercultural and transcultural use and to show correspondences with Western humanism. The initial section is a comparison of the central principles of the Islamic humanist tradition from the classical through to contemporary times with the Western humanist tradition as they relate to conceptions of the good, ethics, the construction of meaning and a set of higher order values predicated upon human dignity, integrity, empathy, well-being and the public good. In both, professions are viewed as meaningful work that allow for large measures of decision-making, and are grounded in human qualities and needs including autonomy, freedom and emancipation balanced with responsibilities, obligations and duties to society. These are compared with principles of knowledge in Western humanism. Secondly, the chapter examines the principles of good or ideal leadership and administration that humanism aims at in its preparation of officials, including those in the educational sector in the classical Islamic tradition. The chapter concludes with a discussion of how the Islamic humanist tradition can contribute to intercultural and transcultural graduate teaching in international educational administration.